A few days ago I returned from being out in the Peep Hen, SERENITY, for almost a month. 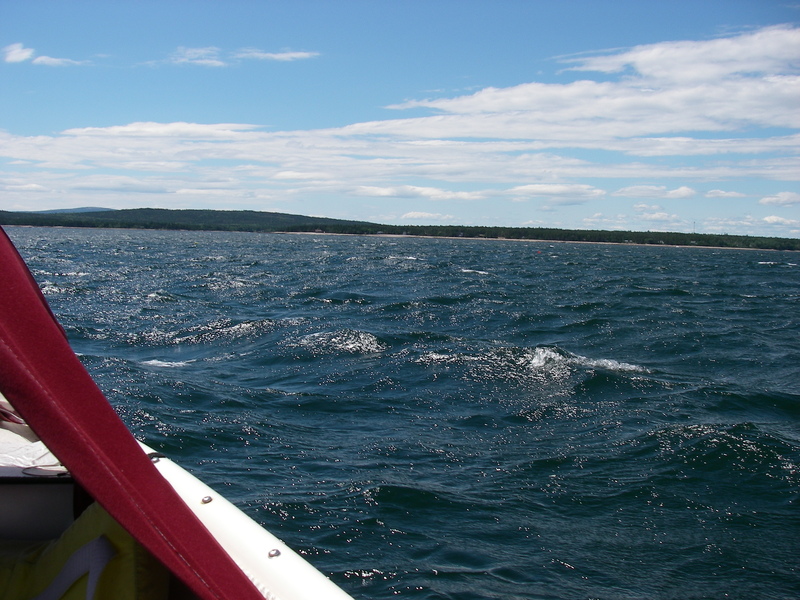 This trip unfolded gradually – when I left, I told Suzanne “I might be back for supper.” In the end, it worked out to go all the way to the far southwest corner of Penobscot Bay, and to give the boat a proper, full-scale test. Along with the sailing, and quiet harbors, the best part of the trip was wonderful visiting, all along the way. One of the more common questions I was asked, by folks familiar with both AUKLET and now this boat, was “which one do I prefer.” I’m continuing to think on that subject. The first thing one notices about this boat is that it is little. Compact, but including all the basic necessities for a substantial excursion. The picture at the top of this post was drawn by Julia Lorenz, my friend Kent’s granddaughter, who turned six this summer. She did this on their chalkboard, from memory, after our first meeting from Kent’s Peapod. I love the drawing, and the critical points that caught her attention. The little peep on the sail, the electric outboard, out of the water off the stern, the dodger, and the red of the canvas. It pretty much says it all. 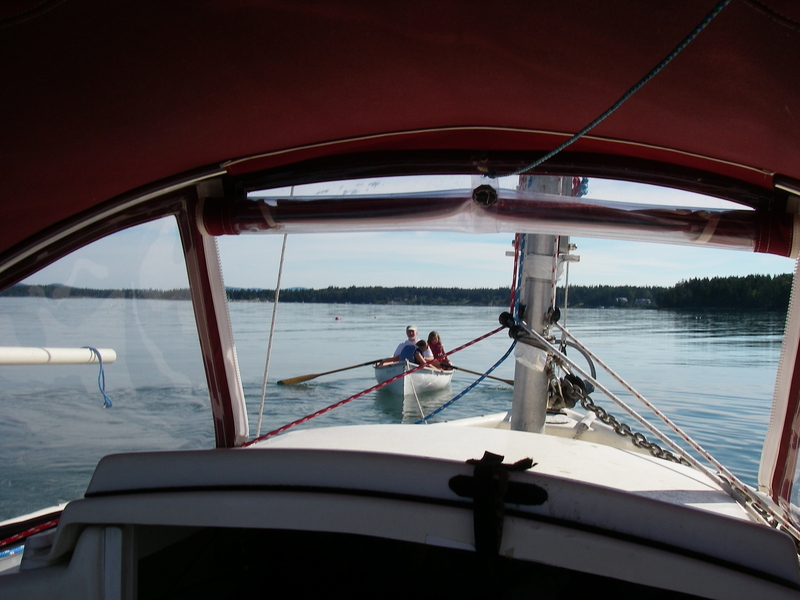 SERENITY came to live with me in something like 2006, around the time that I sold the Falmouth cutter, NEW SALT. One can’t, after all, be without a boat! 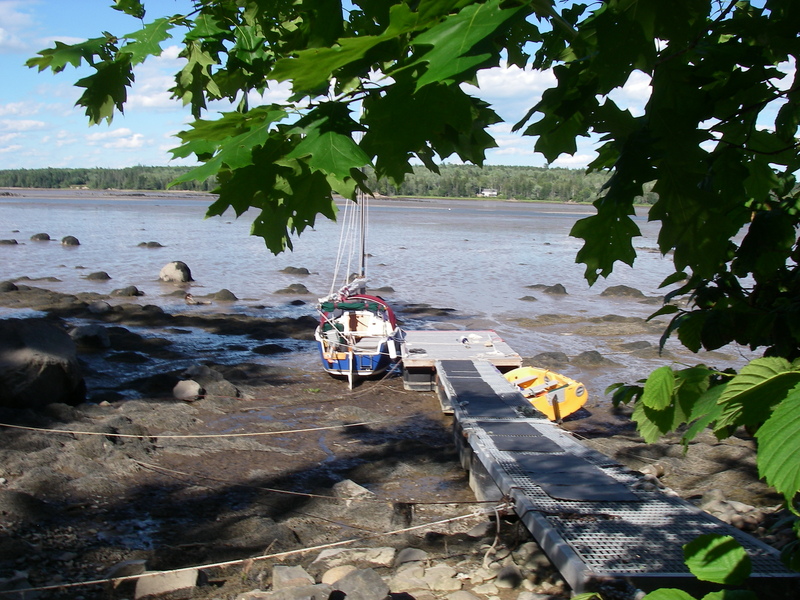 We sailed on the Connecticut River in Holyoke, Massachusetts, and then over the next couple of years made some more substantial trips, myself and an assortment of crew, along the southern New England coast. The building of AUKLET was begun during that time, and after AUKLET arrived in the driveway in late 2008, SERENITY spent a very long hiatus in the garage, waiting for whatever would happen next. Moving to Maine last fall opened up the opportunity for this boat to come into its own. 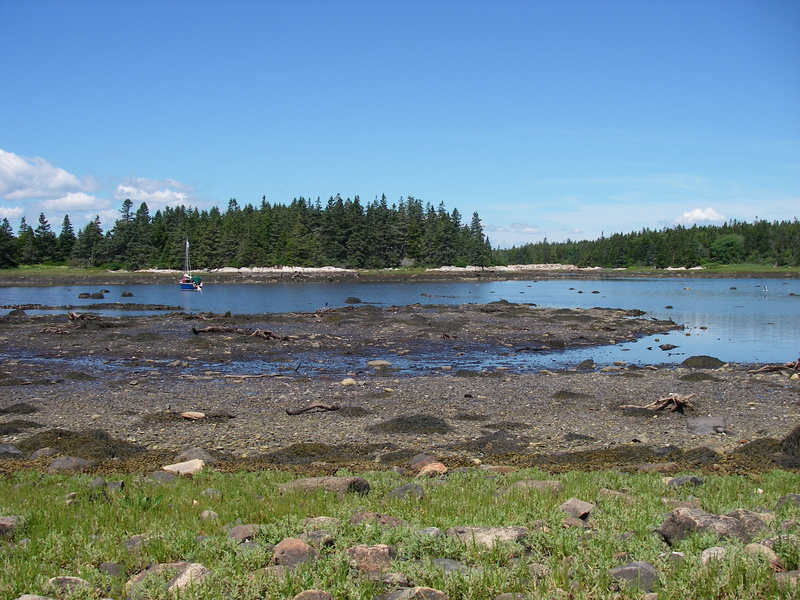 It is shallow draft (10 inches), and when the tide goes out over a nice mudflat or sandbar it will sit flat, within easy reach of stepping right off the boat. At 14 feet long it is easy to store, and relatively polite when it comes to visiting dinghy docks directly from this, one’s primary vessel. It sails surprisingly well, especially as one gets used to the nuances of the off-centerboard, which drops down alongside the broad box keel. In heavier seas those high topsides deflect the spray, and the boat rises easily over the waves. 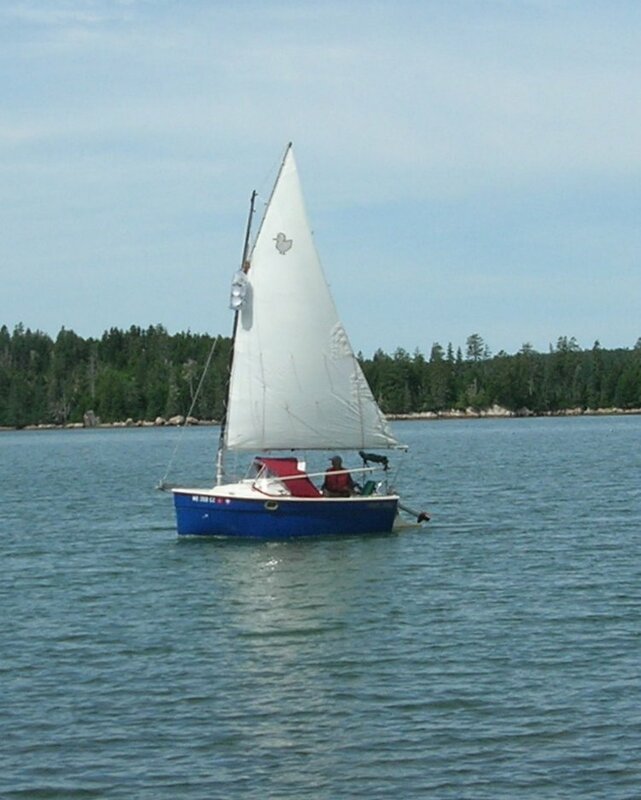 Loaded for cruising its motion improves, losing the bit of a snap that the flat bottom and ballasted keel contribute to in waves and changing wind when the boat is mostly empty. 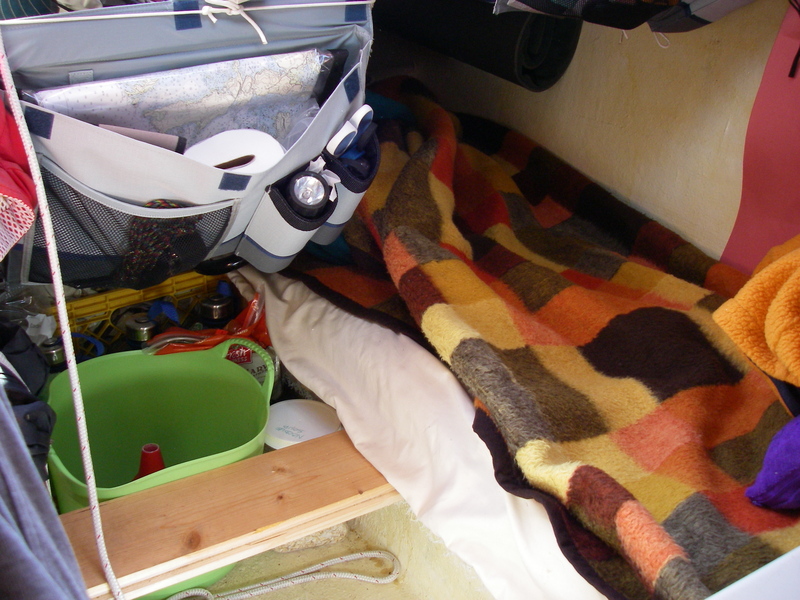 Inside, there’s room to sleep, to sit, and to carry a good supply of food and water, and bits of equipment. Mostly, I have stuffed the bow and extra space under the cockpit benches with various kinds of flotation. Inflatable flotation bags are strapped in, and an assortment of old throwable cushions and faded orange PFDs, squeezed into available corners, are tied one way and another so that they will stay useful in the event of the boat becoming it’s own lifeboat (we hope to never test this). There’s a workable composting head arrangement, that deserves its own post, an adaptation of the system that has done so well for AUKLET. Still, it’s snug. The first time I spent a night scrambling in and out of that little berth, I marveled at the fortitude of the friends who came to sail with me years ago, myself sleeping in the cockpit. The inside berth was the “cushier” quarters, and it is quite comfortable and fairly roomy once you are in there, but the scramble involved for a relatively tall person to get in and out is significant. Kate Fahey, I salute you! And each of the women who so generously came with me to make those trips possible. Getting in and out of that berth does get easier, with practice, and I appreciate the security, especially in rolling waves, once in. The second night on the boat I carefully arranged the cockpit for sleeping – awning, mosquito netting, blankets, etc. – went to bed in my old spot from all those years ago, and within a half an hour started to think about that maybe that interior berth wasn’t so bad after all. By another half an hour later, I had decamped to the inside, and that’s where I slept for the rest of the trip. Grumbling, now and then, that AUKLET is a heck of a lot more comfortable, but appreciating the cozy sense that one could neither fall out of the boat, nor be thrown by waves, and that if there was surprise rain there would be no struggle with SERENITY’s cockpit side awnings and flaps, and inevitably moist blankets and occasionally downright wet feet. Other comparisons with AUKLET come up too. More overall comfort in the bigger boat is an ongoing theme, as is the sturdier sailing in more boisterous conditions, and the much improved motion, compared to SERENITY, in a rolling anchorage. The ability to get completely out of the weather in that big cabin, including while under sail, and the self steering that so often works well, are like a beacon, making me ever so happy that the boat is only as far away as getting pulled out of the boat shed and put in the water. SERENITY has the advantage of drying out flat, and going far into the well-protected back corners of so many harbors. But I measure this against the comfort of AUKLET: what is the balance point, between the bottom of the tide over at 25°, in a substantial cabin that is so comfortable the rest of the time, and flat all the way through the tide, but perpetually scrambling? Between nights in deeper water, to stay upright, and those hidden coves, that dry with the tide? Or the ease with which this boat is towed, by a ROWBOAT, when the wind dies? AUKLET has all that lovely interior light, room for plants, and most importantly when the colder weather comes, heat, both passive solar and charcoal-driven. These are serious advantages. On the other hand, from that berth in SERENITY you can reach just about everything, from all the charts on the boat to dinner and dental care. The boat is easy to launch, easy to retrieve, and stores in a smidgen of space. Raising the mast does not require special volunteers with exceptional strength and spar-balancing abilities. Sitting at our half-tide float, SERENITY goes up and down with no complaints whatsoever, resting on mud, floating on water, and resting on mud again, while we leave the boat alone, or climb all over it doing projects, or scramble into that berth for naps, with mud or water making no difference. The boat suits our little dock exceptionally well. Hands down, AUKLET is better for setting off across the Gulf of Maine – this is something that I would not do in SERENITY. But for closer to shore it’s a very evenly balanced toss-up. The little backpacking boat has held its own quite nicely in the face of some very stiff competition, and I’m looking forward to sailing it some more. With luck, AUKLET will be back in the water next spring. In the meantime, the Peep Hen and I are having quite a lovely summer. That solid “thud” you just heard was me, kicking myself again for letting go of MY LITTLE CHICKADEE. Your observations on life onboard are spot on! 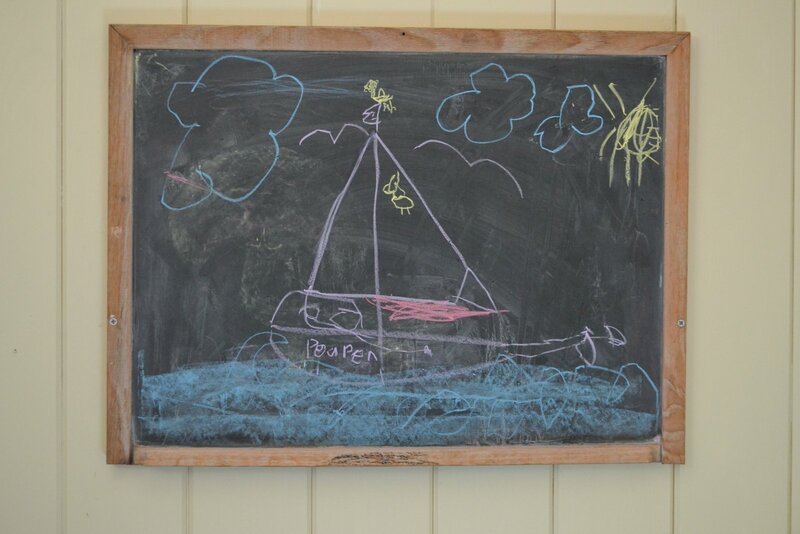 Speaking of spot on – Julia’s chalkboard drawing included a name on the boat’s side: PEAPEN! This is so right in so many ways! I’ve been wondering how you’ve been getting along without MLC. Any chance you can get the boat back?? I’ve been wondering if it had a name change, and what the new owner has been up to with it. Maybe they are like some folks, who sell the boat after two or three years, and there’s your opportunity! Thanks for this delightful piece comparing the advantages of SERENITY and AUKLET. I do remember the coziness of the berth on the Peep Hen, and the challenges of maneuvering in tight quarters. So glad you have both, and now live by the sea, able to go forth in whichever vessel suits your fancy. Thanks for the lovely illustrations. Yes, I was thinking of you too, both writing that and climbing in and out of that berth! It’s been a treat, being out in the little boat. Fascinating, learning to sail it better. Still, we got pretty far, in the early learning phase! I love the chalkboard drawing. Our daughter did several drawings of Manatee as she grew up around the boat. In your photo of Serenity what do you have hoisted at the throat? I tried magnifying the photo but still could not ID what is hanging there. I really liked your write-up. A whole month aboard, WOW! That’s great about your daughter’s drawings of MANATEE – what a nice thing to have, over the long term. I’ll bet that she gets a kick out of them too, as a way to look back on all that boat time! Have you been getting in plenty of sailing this summer? I hope so! Hi Shemaya,, thank you for the tales on board the Peep. You just convinced me that a Peep is the right boat for me.. I have sailed larger boats..but must downsize. Appreciate your comments at the tiller,and your safe handling of this Little Peep.,, so much to learn and so little time left !! any Peep for sale out there ?? Hey, that’s great that you are fired up about a Peep Hen! Yes, about reefing early – converting to junk rig is particularly appealing for that, as well as for easier sailing overall. It’s in the works, here. Have you seen the yahoo group titled “Hensnest”? That’s the best place to find one for sale – they are not always available, but one or another becomes available now and then, and somebody usually mentions it in that group. I’ll copy the link below. Where are you located? If I hear of one in your region I can let you know. Hi Shemaya,,I am located in ohio,, have had many boats,, raced a Flying Scot,, and a catalina22,as well as a Colgate 26. AM interested in a Peep with no projects,,as I am getting tooo old for that . Keep on looking for me,, thanks,, I have sailed the great lakes,, Champlain,, Gulf of Mexico,, and chartered in the Virgin Islands,, thanks,, George . Gosh, now it’s the middle of winter! I’ll be keeping Ohio in mind. Wishing you the best of luck with your search, and happy sailing. HI Shemaya,,thanks and Happy New Year to you,, Still looking for a Peep. Patience is the key word,, wishing you good Health in 2019,,, George R.